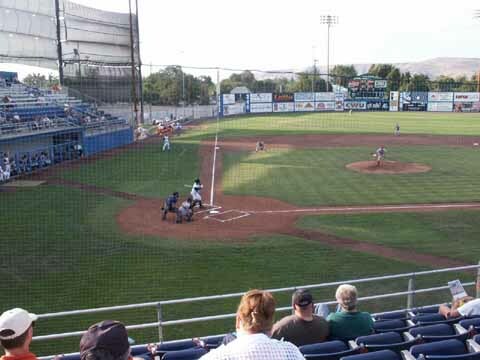 We brought our good luck to the Yakima Bears game tonight. 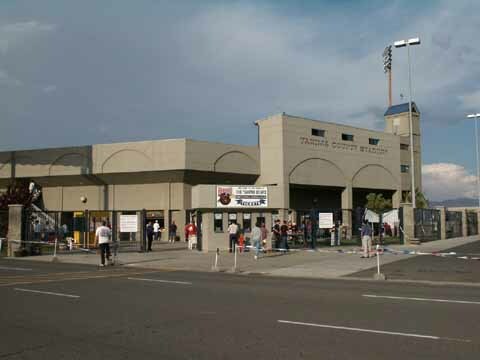 This is our 32nd game and the home team, who we root for, unless an Ms affiliate is playing, has won 23 games. 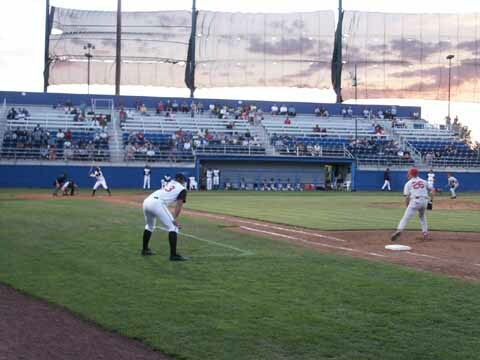 The Yakima Bears, a Single A affiliate of the Arizona Diamondbacks, play at Yakima County Stadium, which was built in 1993. The Bears hadn't won a game during August and were on a 22 game losing streak. 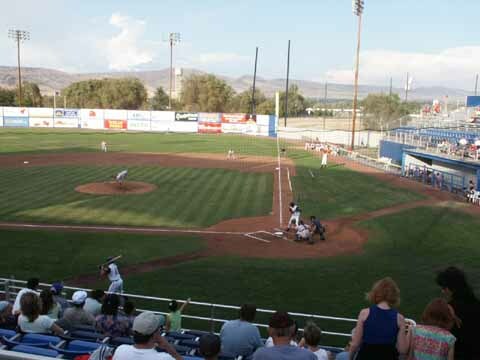 But tonight that ended when they beat the Spokane Indians 8-2. 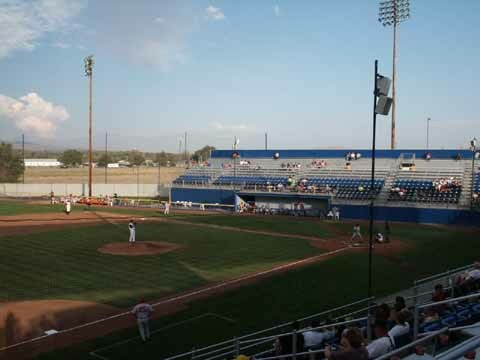 Yakima County Stadium is a nice park with seats and bleachers with backs and no backs. 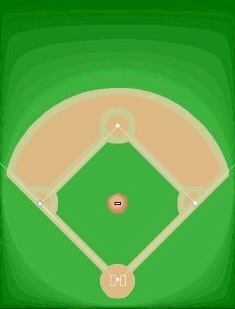 All seats are close to the field. The flooring is all aluminum, so it gets noisy if everyone starts stamping their feet. 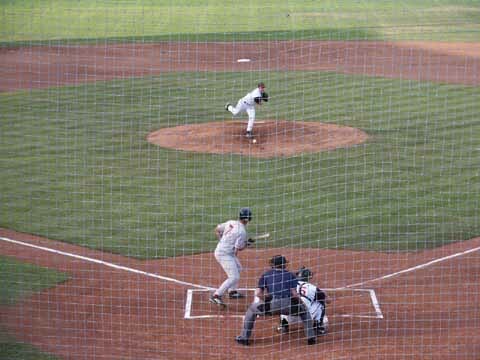 It was a great night for baseball with the temperature starting out in the 80s and cooling to the upper 70s. Prices for food are excellent. Tonight was Spaghetti Sunday and for $3 you got a plate full of spaghetti with meat sauce and two pieces of garlic bread. They have the largest hamburger I have seen, a 1/2 lb. Family burger with a bun of at least 6 inches with the meat hanging out the side, for only $4.75. 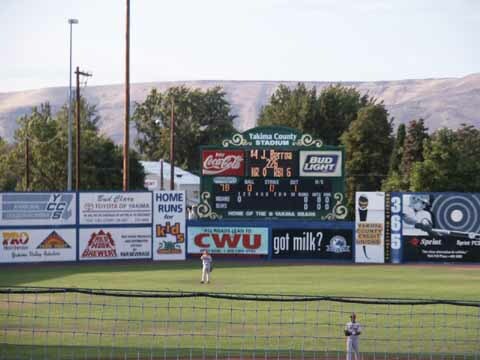 There is a group of fans on the 1st base side who hang up Ks when Yakima gets a strike out. 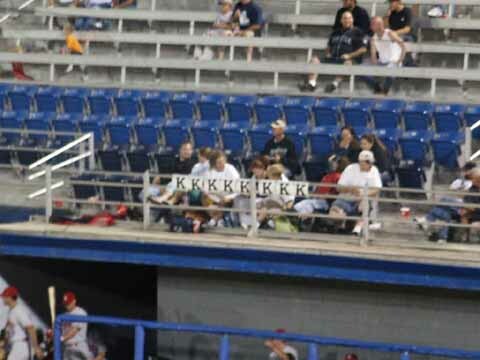 Then they all chant to the opposing batter "One, Two, Three, See Ya." 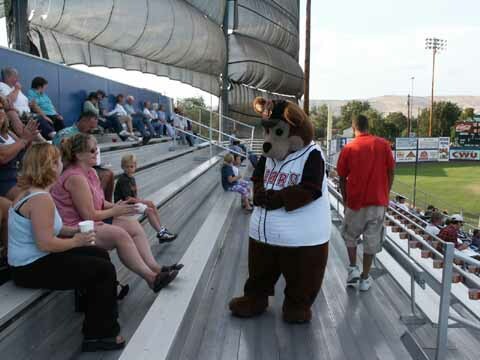 Boomer the bear is the mascot. 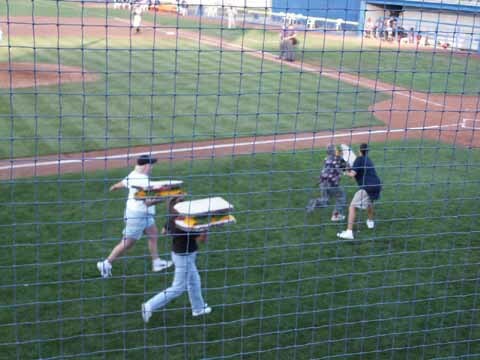 They have several between-the-inning contests including one that required the contestants to carry a huge make-believe sandwich a short distance without dropping it. 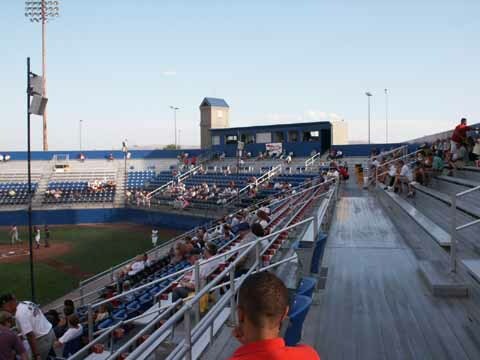 The attendance was 997 which is somewhat expected based on the team's August performance, whose last game was won July 31st. The field lines are really non-standard, RF-239', moves out to estimated 300', RC-375', CF-a corner at 406', LC-365-385', LF-starts at 293', moves quickly out to 340'. 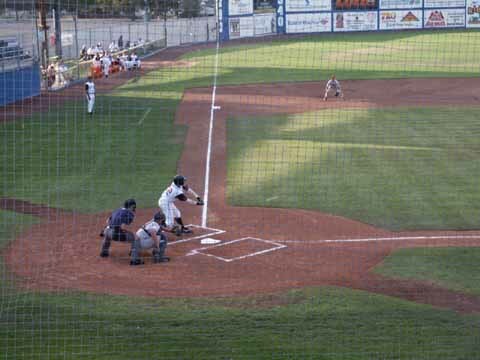 The box score was Spokane R-2, H-4, E-2, Bears R-8, H-7, E-0. After the game they had a Run Around the Bases that included kids and adults. 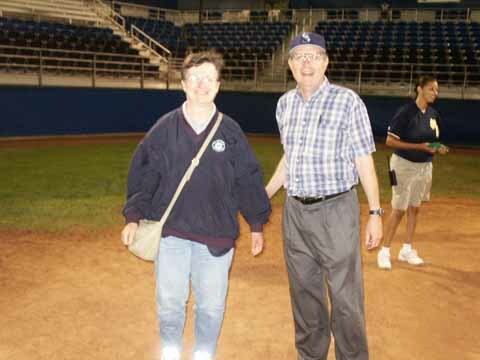 This is the first ballpark to include adults, so the picture of us is at homeplate as we began our run. 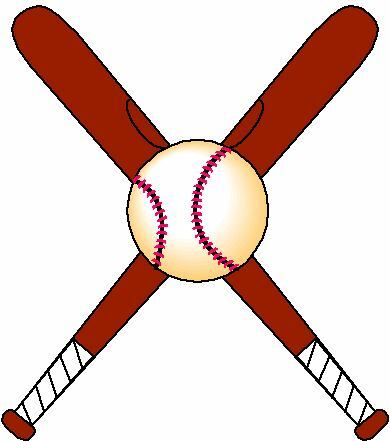 New Logo 2007. Fort Simcoe State Park - west of Yakima, one of two interior Washington Territory Army Post established as a result of hostilites between the settlers and Yakima Indians in the fall of 1856, see travel section. 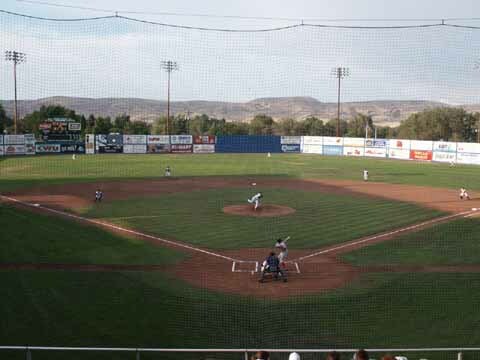 Gateway to Washington Wine Country - Yakima is in the western part of the Yakima River Valley. Washington's Fruit Place - offers interactive displays showcasing commercial fruit tree production in WA. Toppenish, SE of Yakima - known as the city of Historical Murals. Artists have transformed the outside wall of many buildings with colorful scenes depicting pioneer live in the area. Toppenish, American Hop Museum - traces the history of the hop industry in America, see Travel.